If you are looking for space, these two Condos at Tres Tesoros may be perfect for your group! 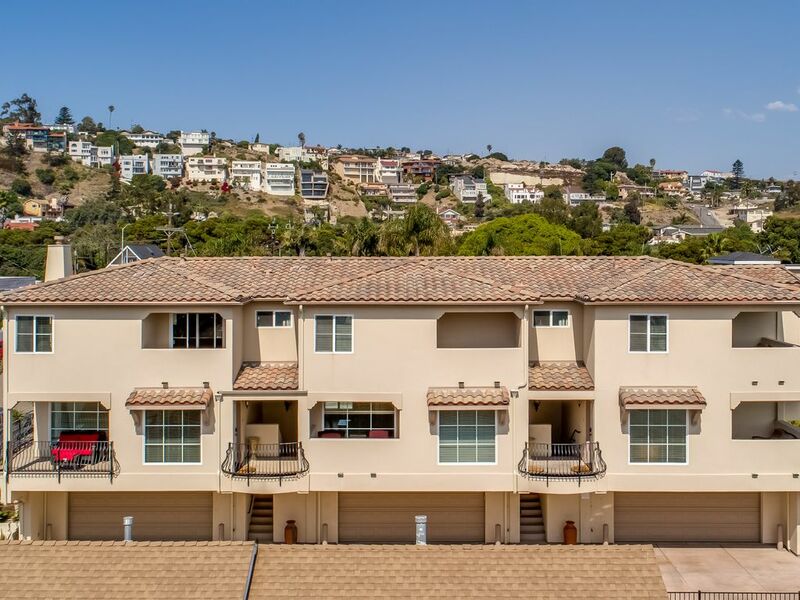 Tres Tesoros is a Triplex located in the heart of downtown Pismo Beach. These two condos, B and C are two of the three condos in the complex. We offer these two ocean view condos combined for your larger group gatherings. If your group needs even more space, view Condos A, B and C together at VRBO# 111810. Together B and C represent 5 bedrooms, 5 1/2 baths, two fully stocked kitchens, 2 two car garages, 2 washers and 2 dryers, 4 ocean view decks, etc.! Wow! Here is the place for your large family gatherings! If you want to ALL be together, but want a little peace and quiet private time later, this is the location for you. Separately Condo B (La Casita de Bailyn) is a 2/2.5 and Condo C (La Casita de Colton) is a 3/3. These are right across a hall landing from one another. Each luxury condo has a two car garage, gourmet kitchen, family room. All bedrooms have top of the line luxury sleeping accommodations. Each has a master bedroom with a Cal. King bed, B has a full/full bunk and twin bed, while C has a queen bed. C has an additional 3rd bedroom with another twin/full bunk. Both B and C bunks are set up wonderfully for children or teens. Together these are wonderful for a maximum adult occupancy of 12, or together 6 adults and 6 kids maximum occupancy. There are flat screen TVs in each bedroom and family room. Each condo has private balconies with beautiful views up and down the coast. Each condo includes wireless internet connections, washer and dryer in garage, deluxe shared BBQ, exterior shared foot wash for washing off feet and boards. No Pets, and no smoking allowed. We advise booking ahead of time, even 6 months or so... because these condos can book independently. For more information, please email owner/property manager. Most summer weekends have a three night minimum and holidays and special events are often longer minimum stays. Off season we do consider 2 night minimums or longer term stays. We also have one other ocean view condo, Condo A at the same location for even larger family gatherings. Keywords: 2 Condominiums, condos, beach, ocean, large groups, sand, downtown, bars, restaurants, 5 bedroom. My husband and I completed construction on Tres Tesoros in 2006. We replaced many of the furnishings in 2016. We spent about a year designing the Tri-plex. We named the building Tres Tesoros after our three wonderful children. Each condo is named appropriately after one of our three children. We have Condo A... La Casita de Amelia, Condo B... is La Casita de Bailyn and lastly, Condo C is La Casita de Colton. We also have some other properties located just south of Pismo Beach in Oceano, CA. We also have several things in Colorado as well. Only Condo B has a half bath. Walking distance to downtown Pismo Beach, shops, restaurants, coffee shops, bars, pier. Approximately 2 blocks to the ocean. Ocean view from family rooms, some bedrooms and decks. Additional parking may be available on Harloe Ave. Private two car garage for two medium cars or one SUV. CANNOT PARK ANYTHING OVER 7 feet in garages. Towels for bathing are in each condo. These are not to be taken to the beach. We do offer a few beach towels for your use only. We don't supply these items but we don't remove anything not expired. Each condo B and C has it's own full kitchen. Each unit has a table seating 6.
each bedroom has a flat screen TV. Some sand toys in the garage. You can rent these locally. In near by San Luis Obispo, Avila, Nipomo, and Arroyo Grande. The ground level is the garages. One must take two flights of stairs to get to the landing at the front door. We do not have any elevators. Price reflects renting both condos together. One condo is 3BR/3BA (C), across the hall is a 2BR/2.5BA (B). Maximum occupancy is 12. Wonderful spring break at the beach! Great stay, great property, great beach spot, super clean and well managed. We will definitely return soon! Pismo Beach is a beautiful beach anytime of year. Love the SLO life! We walked just a block to the ocean and one more to access the beach. We had three families (12 in total) and rented out Condo A & Condo B which had adjoining entry porches so we could flow easily between. These condos are well located - lots within walking distance, although a bit too close to Old West Cinnamon Role shop, which we frequented! Only about 15 minute car trip to the dunes. Parking was excellent - each unit has a two car garage beneath it. We appreciated quick responses from David throughout our experience. We rented out condos B & C. Our group of 10 spent most of the time in the larger condo C for meals and family bonding. Each room had full baths which made it so convenient for getting ready each day. Location was ideal! Walking distance to restaurants and the beach. Parking was so easy with the 4 car garage. It was definitely a memorable stay at a very clean and beautifully furnished home. Next time we come back to Pismo Beach we will definitely be staying here again. Thank you Marian for everything! I'd be honored to have you and your guests anytime! Thank you for choosing one of our places for the weekend. The condos are in a great location; not far from the Pismo Beach Pier. The pier and beach are both in walking distance. The pictures on the webiste show the condos just as they are: like new -- spacious and beautifully decorated; very clean and well maintained. Marian was very helpful and a pleasure to work with in arranging for our stay. The condos met our needs in every way; fully equipped kitchen, everyone had their own bedroom and bath for privacy, and centrally located. We had a wonderful time and would recommend this property to friends and relatives. My extended family stayed in Condos B and C. We were so happy to find a place with 5 bedrooms after our previously booked location cancelled on us a few months before our arrival date. We were more than happy to find such nice and well kept condos when we arrived. All basic amenities are provided (towels, soap, sand toys and much, much more!) All appliances, electronics, and furniture are well taken care of. The beach and downtown are a few blocks away. Our only problem was that the wireless internet kept going in and out. Not sure if it had anything to do with so many people trying to use it (moms on smartphones and kids on ipod touches) or the fact that the router is only in the middle condo. Perhaps they need a booster. Anyway, no worries as we were all on VACATION and not in need of doing any real work! We would love to stay there again! Our family of 16 spent a wk in Pismo. Although our girls had grown up in Cambria, we rarely had been to Pismo, so this allowed some exploring as well as checking out our old haunts. . .The cinnamon roll place and the burrito place and the beach were all within walking distance. The condos have wonderful beds and bedding--we all slept well. We went to the Hearst Castle, had tea at the Tea Cozy in Cambria, lunch at Linns and had a wonderful last evening at the Melodrama. We went to the beach at Avila and rented ATVs at Oceano. Also went to Solvang for a day. Pismo is so central that we appreciated the location. There are lots of stairs, so I wouldn't recommend the condos for the disabled or elderly. Wineries are within 15 minutes. Beach is 1.5 - 2 blocks. These two condos are highly sought after by larger groups who want to be together but enjoy privacy when necessary. Enjoy many things the area has to offer. This ad is for two condos, B and C of a large Triplex complex. Together they make up 5 bedrooms, 5 full baths plus one half bath, two kitchens, two 2 car garages, etc. Cleaning, insurance and refundable security deposit required. Many holidays and special events require 3 night minimums or more stay winter, summer, special events, etc. Tenants wanting longer stays please contact the owner/property manager for longer stay rates.